As the movie started and the plane took off into the air, the gentleman next to me pulled out a paper bag. It was McDonald’s from one of many locations in the Chicago airport. There are always long lines in front of each. In the bag was a serving of hash browns and an egg McMuffin. This was an evening flight. Here was another customer benefitting from the new all-day breakfast menu. It smelled amazing, and he was very happy. Everyone around was jealous. 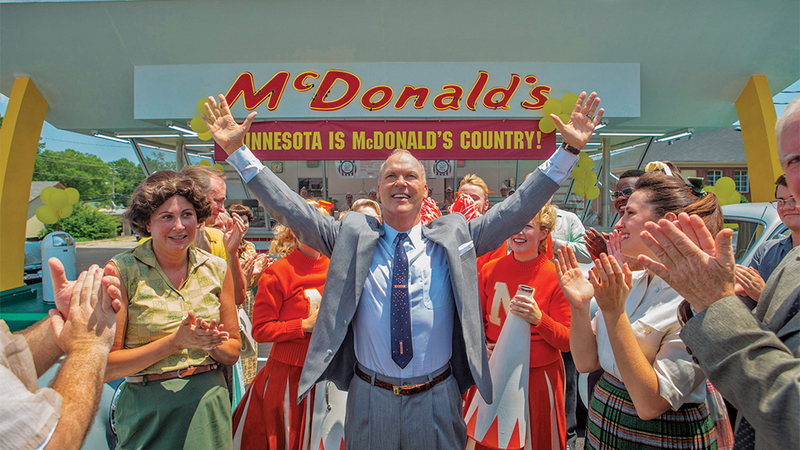 I’m thrilled to recommend this movie very highly.I was remiss in seeing The Founder – a beautiful film about the early years of McDonald’s – when it came out last year. On this flight, it appeared as an option on the screen in front of me. I went for it. That’s the man next to me pulled out his bag as if to provide ambiance. I’m thrilled to recommend this movie very highly. It’s so rare for any major movie to explore the great drama of entrepreneurship and free enterprise, and rarer still for one to do it without demonizing the winners of the competition. Yes, it dishes some dirt on Ray Kroc, who made McDonald’s what it eventually became, over the lame objections of the original founders of the company. But that’s fine. As with so many other business-centered films, if the purpose was to make Kroc look bad, it doesn’t really work. If the purpose is to make capitalism seem ruthless, it backfires (as with so many others), because the drama of commerce itself is just too exciting and attractive. It’s just a beautiful thing to be witness to the human drama that enabled the flowering – from nothing to nationwide – of a game-changing business, to watch the unfolding of wealth creation, to see a product and service be born into a world that will never be the same. McDonald’s is part of the life template of just about everyone in the world today, including you and me.The film makes a big and lasting impression. McDonald’s is part of the life template of just about everyone in the world today, including you and me. Eating there is one of my earliest childhood memories. Probably yours too. We’ve all watched the changes through the years: menu items, marketing, interior, and so on. There is probably a restaurant within a few miles of your house. Everywhere I’ve travelled – Rome, Vienna, Prague – my tour guide is always excited to point out the local McDonald’s and tell stories about its arrival and the fun times there. There is this scene early on when customers are experiencing what it is like to reach in a bag to grab their food and get their first taste, people who had only known food served on a plate, perhaps hanging from the car window. Who can’t just smile when watching this? It’s like opening a time capsule. With this film, we have a source for an exciting story about the early years of the company itself. It seems obvious, but it is not: history could have been different. We take McDonald’s for granted, same as every other luxury today. If someone had handed Louis XIV burger, fries, and shake, who doubts that he would have been overjoyed? How is it even possible that a food that no 17th-century king could get is now available to the masses of humanity for around a dollar? We ought to think about the answer to that question. In truth, to eat a Big Mac is not a human right that nature provides. 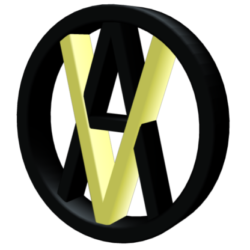 Its existence was not inevitable; it had to come into being through human effort, marketing, promotion, hard work, high risk, daring, suffering, and (the theme of the film) persistence, in a society where enterprise is valued and people are free to take risks in the service of others. Only government would make it impossible to use a family name on a family business. As the story goes, the original McDonald’s was just one branch in San Bernadino, and the founders were too narrow-minded, squeamish, and lacking in vision that the situation proved ripe for a go-getting promoter like Ray Kroc to come along and franchise the idea. At every step, he faced resistance from the original founders. Finally, with the help of others, he hit on the idea of buying and then leasing the land on which the franchises sit, and this is how he made his money. He leveraged his earnings to finally pressure the original founders to sell the company. And of course there has to be some drama, so Kroc comes across as ruthless and cut throat, and just to make sure the audience gets the point, we get to witness a bit of heavy drinking and womanizing thrown in to signal some disapproval of this man. The capstone of his thin ethical standards comes at the end when Kroc demands that the original founders take the name McDonald’s off their restaurant because Kroc now owns the trademark. Seems pretty egregious but note that this action was made possible only by government power. Only government would make it impossible to use a family name on a family business. It makes no sense but so it is when bureaucracies get involved. Kroc bought not only the franchise but the brand itself. Oh, and the original founders became mega millionaires (in today’s dollars), so I’m not exactly crying for these dudes. It’s not unusual that founders fail to see the potential of what they have created. In fact, it is extremely common. Their idea attracts the best talent whose vision extends beyond the founder’s own. What sets in is what’s called Founder’s Syndrome. The founder gets confused that the business or organization is his or hers alone (absurd because enterprise is based on an idea and ideas resist exclusive ownership) and should be solely responsible for its product, tone, purpose, and proper destiny. The founder often has to be driven out or kick the bucket before the potential can be realized. Surrounded by people with higher ambitions, which can only be realized with change, the person who wants to take all credit for greatness becomes increasingly authoritarian (only one decision maker), paranoid (everyone is trying to undermine me), reactionary (this thing is out of hand; let’s go back to basics), and starts to actively work against progress and expansion. As happened to Habitat for Humanity, and countless other commercial and nonprofit enterprises, the founder has to be driven out or kick the bucket before the potential can be realized. This is precisely what Ray Kroc faced. He wanted cost-saving measures. He wanted to sell commercial space on the menus. He wanted to expand to meet market demand. He wanted to renegotiate his contract to reward his efforts. But the founders said no at every turn, and delighted in doing so. There are important lessons in the movie for that age-old question: how can I make money? The answer is always the same: do something or sell something that others want to buy. But what? Here is where alertness to unmet needs comes into play. The early parts of the film show people waiting too long for burgers at drive-in places, and dealing with loiterers and vagabonds hanging around. Kroc experienced this too, but he was too busy trying to sell blenders to see the opportunity or the solution. The McDonald brothers did see the solution but they failed to imagine the possibilities for what they discovered. Enterprise works this way. Success comes through the right combination of talents, ideas, persistence, access to capital, the right networks, and a consuming public ready for what you have to offer. As long as I can remember, people have predicted that McDonald’s has seen its best days and will be driven down by competition. On the point about networks, there is an interesting scene in which Kroc sells a franchise to some friends at a high-end club at which he is a member. But he is devastated to discover that the buyers had no real interest in running a business; they just wanted passively to make money. 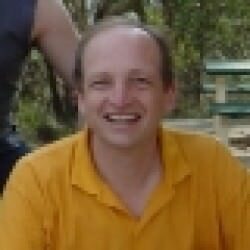 He completely shifts his social circle and starts selling franchises at lower-end community groups where people are willing to work hard and be dedicated to the task. And the idea took off. As long as I can remember, people have predicted that McDonald’s has seen its best days and will be driven down through competition. It might have happened many times but somehow McDonald’s keeps adapting, emulating the competition, refurbishing its marketing, changing its menu, and finding new markets for its product. It’s a lesson in survival. As a culture, we need to have a greater appreciation for the mechanics and imagination that it takes to create and sustain an enterprise like this. The Founder is a marvelous contribution to this cause. But will people watch and learn? Not the guy next to me. He loved his Egg McMuffin but his movie choice was an interminable documentary about endangered species. Sorry but the black-footed ferret, as wonderful as it might be, contributed nothing to bringing him his favorite breakfast at 6pm that he could eat while flying through the air in a comfortable seat, loving every bite. Can this be re-read by a third party for proofreading because there is a repeated sentence. Thanks! @glendonnelly Jeffrey seems to repetition quite often, I think it’s intentional. @sleepyhead If you click the link at the bottom of the article, it will show you the original post at FEE. Here, you will see some boxed “pull-quotes”, used for visual effect to attract the reader’s eye. When the text is ripped from FEE for re-posting here, all of the text is posted as one long blob, including the pull-quotes, and the pull-quotes get inserted as repeated sentences in the wrong place within the text. It’s very sloppy. Thanks Roger, that makes sense. That repetition kind of annoyed me at first, but otherwise I really enjoy Jeff’s writing, and just learned to ignore it. I'll have to be impolite enough to say I'll read this article later even tho I should read it before commenting I really should… Oh well, I'll go back to reading Human Action.